And February is already proving to be a real live music lover's dream, judging by the sheer amount of live music events happening across the North East each night. Below are just a few of our picks, and we have thrown in a few bonus events because it was just too hard to choose between them all. What better way to start a new month than with one of our own showcases of exciting local bands teeming with enthusiasm and energy. Featuring the distinctly different dream-pop band Static Blue, fast and furious post-punk group Roxy Girls and feel-good indie band Mayfare this is sure to be another packed out night to remember! An incredible new showcase of the best live music from national and regional talent that will host 10 acts on 4 stages across two of Stockton’s finest venues, Ku Bar and the Georgian Theatre. Headliners are loud indie thrashers Blackwaters and equally ferocious Hull rockers Life, while both are preceded by a whole raft of firm local favourites including Llovers, Shamu, Samantha Durnan, Dark Passanger, James Leonard Hewitson, Eve Conway and Pink Tide. A whole lot of live music for just a few quid. What's not to love! Glasgow’s heavy rockers Baby Strange make a hotly anticipated return to Newcastle this month. The release of their rebellious 2016 album 'Want It Need It' and subsequent EP 'Extended Play' last year have already demonstrated the band's ability to deliver ferocious punk-rock anthems that empower and provoke. And with a live show to match, we expect this one to send the the floor of Jumpin' Jacks into serious quakes. Support comes from fellow Glaswegian punk-rockers Rascalton who are bound to start getting those feet stomping early on. Electro-pop marvels Twist Helix start their new year strong with the launch of their sparkling new track 'Ouseburn'. Being well known for their captivating dark synth melodies and enthralling live shows we can’t wait for the Newcastle trio to return to this fantastic venue above the cosy Ouseburn pub. Joining them on the night will be 3 dark electronica bands, each with their own unique and exciting sound: The Black Sheep Frederick Dickens, Mausoleums, Mother Night. 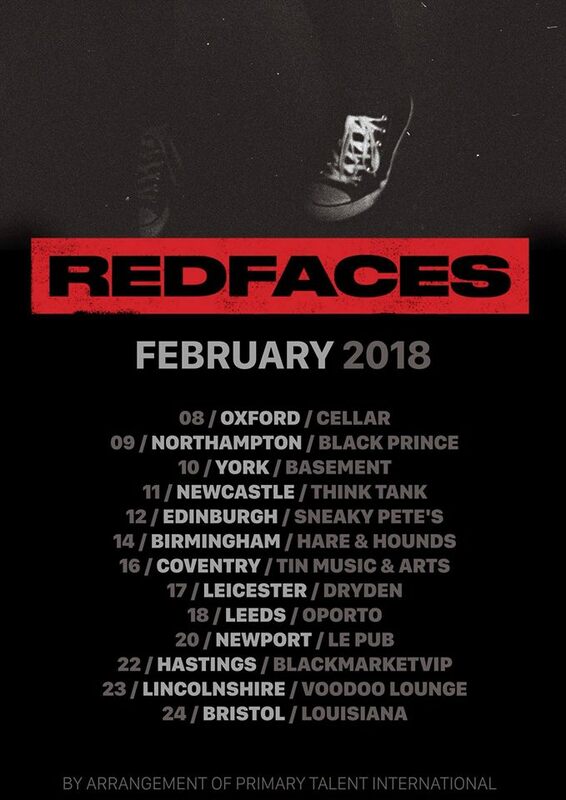 Don’t miss the return of Sheffield’s RedFaces, with their superbly catchy indie-rock sound full of classic brit-pop influences, especially as the band have just been hotly tipped as part of NME’s Essential Music of 2018 list. Support comes from two incredible local indie bands who have both recently smashed their own headline shows: VITO and The Adlets. With a hugely successful debut album 'Tell Me if Your Like To' already under their belt Spring King return with their unique blend of surf pop and garage rock that erupts with unrelenting energy on a live stage. Support comes from two fresh new acts: London based fuzzy grunge-pop band Calva Louise and frantic heavy rockers Weirds. Melodies are guarenteed to induce sugar rushes all night long thanks to this incredibly tempting line-up, featuring one of our favourite local indie pop bands Deep.Sleep alongside the return of Liverpool’s divine female-fronted indie-rockers Scarlet. But not before equally marvelous The Yada Yada Yadas and White Label impress with their addictive pop and rock sounds. A fun filled night of live music that will have everyone on their feet. Returning with another load of sunshine-filled feel-good melodies Cassia are bound to turn Think Tank into a big old beach party. Yet there will be no time for sunbathing as you will be up on your feet dancing along to those hip-shaking groovy indie tunes from start to end. As if that wasn't enough, support from our favourite dream-pop band Llovers and high-energy rockers Susan means we are sure to be nicely warmed up right from the start. After wowing crowds at recent headline shows in Newcastle and Stockton with their sparkling indie-pop sounds and enthralling live performance we are excited to see Cape Cub return to the Toon as part of their nationwide tour. Fronted by Chad Male, their anthemic sing-along tunes and beautifully arranged melodies are guaranteed to make for yet another unforgettable night of live music that will make you feel all fuzzy inside. With their fierce and outspoken alt-rock sound, Husky Loops are as quirky as their name suggests. Their meddling heavy beats, screeching riffs and new-age sound effects with ever changing tempos create a distinct style that makes this London based trio stand out from the rest. And with a real knack for a wild live show we expect this gig to be a real musical adrenaline rush. An original indie-rock night and debut gig for Darlington’s freshest band Lyhmes, who will be joined by the equally promising north east rockers Sonder Minds, Catalyse and Plastic. Expect hauntingly beautiful sounds from York’s finest: The Howl & The Hum. Equally superb support comes from London based electro-pop duo Joyya and two of our favourite local ambient rock bands: Sauvage and Palma Louca. A strong line-up of local and national indie and brit-pop influenced bands. Yorkshire’s The Harringtons and Northern Comfort will be joined by local favourites Fosseway and Carabiniers for this unmissable show. Talent competition winners Many Moons are set to impress with their emotionally driven folk-pop sounds at their debut headline show. Strong support comes from indie-pop band Prize and alt-rockers Men Behind The Sun. A guaranteed night of epic punk-rock and a frenzied live performance courtesy of Manchester band The Blinders plus an equally raucous support from fresh-faced local noise-rockers Savana. On their biggest tour yet, The Sherlocks are bound to have the crowd singing along to every word of their anthemic indie-rock tunes. Support comes from quickly rising psychedelic dream-rock band Neon Waltz and the infectious indie-rockers Oddity Road. With their unique dark-comedy pop tunes and high-energy live show we expect things to get very wild and sweaty in this intimate venue. Support comes from local beach-punk duo Palm Beach. Taking things to the next level with their reoccurring jam gigs, this special showcase will still welcome anyone to join in for a jam session early doors before some fantastic live performances from local favourites VITO, Kahuna, The Pasolas, Hungdrawn and Dead Blue. Fresh from supporting The Sherlocks on tour here is another chance to catch this unique melodic indie rock band in a much more intimate setting. Celebrating the recent release of their debut album 'In Memory Of', the Glasgow rockers bring their multifaceted indie sound to this intimate venue to kick of their UK tour. Support comes from equally superb local bands Jak Jak and Prize. Last but not least, Newcastle’s favourite soul band are launching their 5th studio album in a intimate setting that should be rather special.